1. Wash and separate the lettuce leaves and divide among serving plates. Scatter the sliced cucumber and radishes over the top. 2. Remove the skin from the chicken and discard. 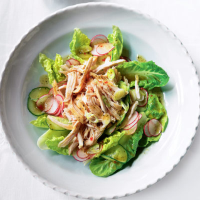 Shred the chicken into bite-sized pieces and place on top of the salad. Drizzle with the dressing, add the salad onions and serve.